It’s been overcast, wet and very grey in Sydney this week. I need some colour to brighten the mood, so have chosen this image of the Great Barrier Reef, taken last year on a scenic flight with GSL Aviation out of Airlie Beach in Queensland, Australia. The Great Barrier Reef extends some 2,300km along the north-eastern coast of Queensland, on the east coast of Australia. There are 3000 individual reef systems with the Great Barrier Reef Marine Park, which was given World Heritage status in 1981. This is Hardy Reef, famous for tiny Heat Reef – so named for its shape, which you can see in the middle of this image. It’s a very popular spot with romantics, many declaring their love or proposing while flying over the heart-shaped coral outcrop. With colours like this, what’s not to love. 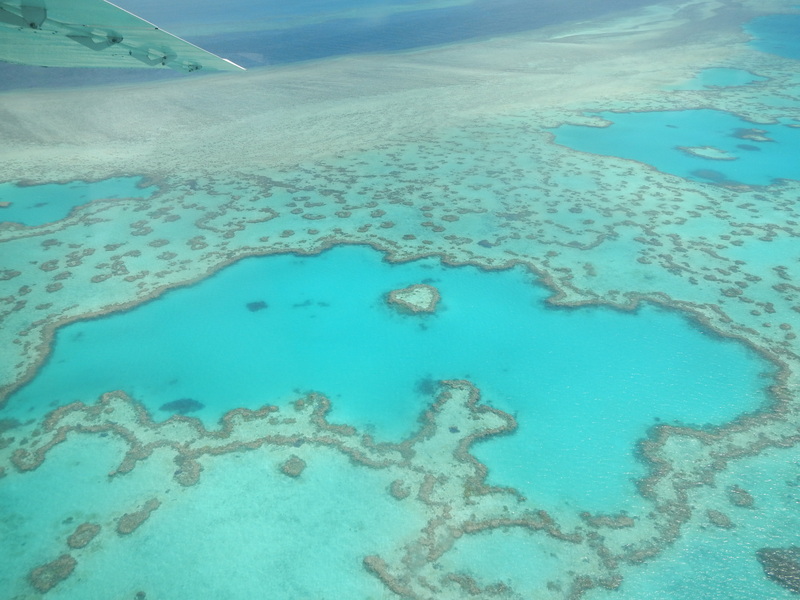 This entry was posted in Attractions, Australia, Postcards, Queensland, Travel and tagged Great Barrier Reef, Hardy Reef, Heart Reef, Scenic Flight, travel. Bookmark the permalink.